As you may know, a) hockey is a religion in Canada, and b) I am a puck-head. If the Olympic hockey tournament in Sochi was winter’s high point, then the current biblical collapse of the Toronto Maple Leafs is its nadir. For non-hockey fans, the Maple Leafs are to ice hockey as the Red Sox or Yankees are to baseball, and Real Madrid or Bayern Munich are to soccer. The Maple Leafs are rich, powerful, and heirs to a glorious tradition. I grew up watching Johnny Bower, Tim Horton, Dave Keon and other stalwarts. Magical names still. As it happens, George Armstrong, captain of the Leafs team that won four Stanley Cups in the 1960’s, is a member of my gym. ‘Army’ is friendly giant – thick glasses, big hands, back ramrod straight, still pumping iron at the age of eighty four. But it’s been forty-seven years since Army hoisted that last Stanley Cup. 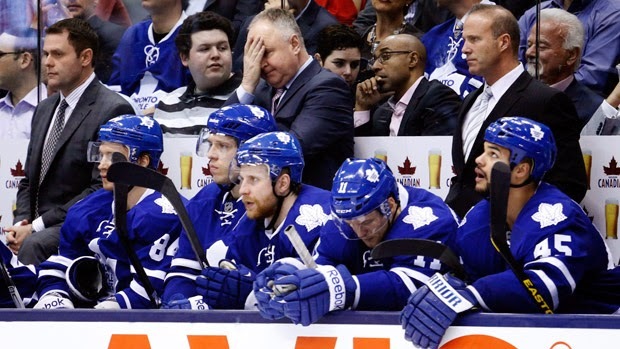 In that time, the Leafs have always found a way to not only lose, but to do so in the most humiliating manner possible. Their latest collapse has seen them lose eight games in a row at the worst possible time – their third catastrophic collapse in three years. Leafs in Free Fall… Leafs Hit Rock-Bottom… Into the Sub-Basement…The Lowest of the Low! Heads will roll, as always, and the deep thinkers in senior management will strip the organization down to the floor boards – again. But it begs a question: How can a rich sports franchise with a huge fan base, and the best players money can buy, continue to fail so miserably? What makes for consistent, catastrophic failure at the highest level of sports? Is it physical? I think not. At the highest levels, the difference in skill, conditioning and coaching is minute. I believe the difference between great teams and also-rans is mental. Great teams invariably have great character and leadership. 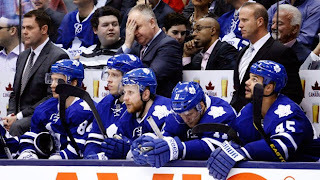 If you agree, then the Maple Leafs misadventures must be rooted in these elusive qualities. And there should be excellent learning there for we mere mortals, trying to lead our teams & organizations to success and prosperity. So what is character? What is Leadership?